Absolutely beautiful! 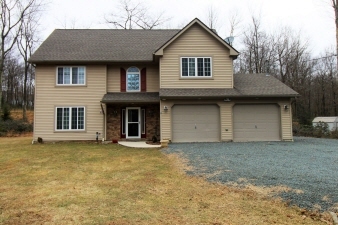 Don't miss this Colonial 2 stall garage with 3 bedrooms and 2.5 baths. This home has all of the high end finishes you can want like granite, stainless steel, recessed lighting, vented fireplace, hardwood, tile flooring, a spacious 3rd floor and a formal dining room. Expansive ductless HVAC system, whole house water filtration and softner. Private 1 acre lot in Pleasant Valley West and central to all of the Pocono activities you enjoy: game lands, hiking, whitewater rafting, skiing, Lake Harmony and Jim Thorpe. Shed is negotiable. Make your appointment for a private showing today - this property does not disappoint!